I don't want to work today. I don’t know why. I couldn’t tell you why. I’m just…not in the mood. That my mood has no bearing whatsoever on the need for my ‘stuff’ to get done is beside the point: I would rather be knitting, or watching a movie, or cleaning the upstairs bathroom. Seriously. This is how not in the mood I am. Toilet cleanliness is higher on my list of things I’d rather be doing. Maybe my lack of interest has to do with the fact that I’ve had a Crazy-Mad week at work this week. Of course I did – it’s month close! Duh! ALWAYS a time of madness. Throw in the full moon last night and well. What do you expect?! Maybe it’s because I’m having a sore week in the joint (no, not THOSE kind, the knee-hip-wrist kind!) department. Of course I’m having a sore week! Because this is a Crazy-Mad week! Murphy would not rest easy if I didn’t have every conceivable inconvenience piled upon me! It is actually a nice little blankie. There is nothing wrong with it, as a blankie. And the needles are nice and big, and don’t hurt my hands – a nice change from those wee little #3 needles I used for Captain Adventure’s sweater. 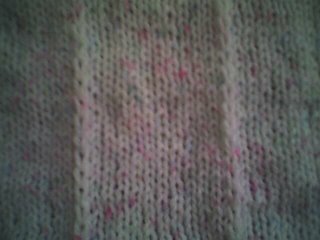 And it made me realize something: when I’m knitting for Stitches from the Heart, I tend to do very simple things. 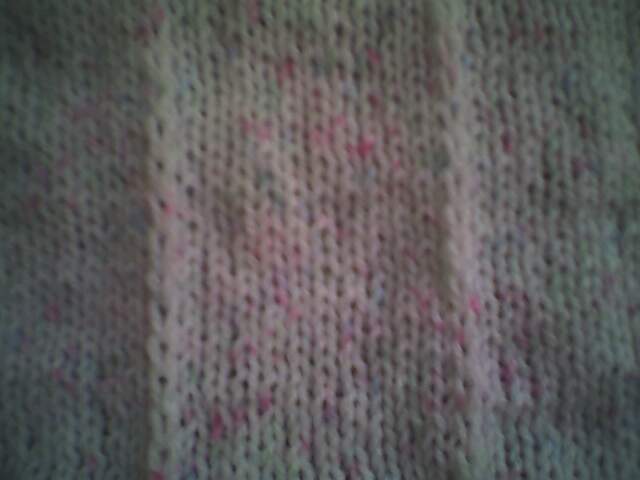 I do the 5 hour baby sweater, or any number of preemie patterns I’ve downloaded from the web. I do basic blankie patterns: squares, textures, simple things. Why don’t I do the kinds of things I do for my family and friends? Why don’t I make this? Or a couple of these? Especially given that they’re constantly asking for toddler sized things. Why the blue blazes don’t I make them cool things?! And then I realized: I feel a need for speed on these. I feel impelled to make more things, rather than cool things. I further realized that this is rather stupid of me. They have a lot of knitters busily working to make things. So if I were to take longer to make cooler things, I sincerely doubt I will be reading headlines tomorrow about shivering babies dying due to a lack of donated hand-knits. I really, truly doubt it. So. After I get this box of The Usual out the door, I’m going to get me some decent busy-mommy-friendly (read as, machine wash/dry) yarn and fill the next box with Cool Things.